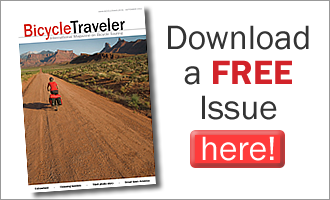 Planning a bike tour? This site is all about inspiring and helping you to get out and travel by bike. It’s written by us, Friedel & Andrew. 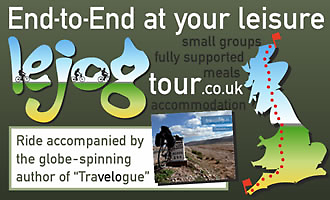 We’ve cycled in 33 countries and by 2010 we’d covered over 60,000km. At that point, we stopped counting but on average we cycle 4,000-5,000km a year. Where to start? That’s a good question. This website contains hundreds of articles and resources. 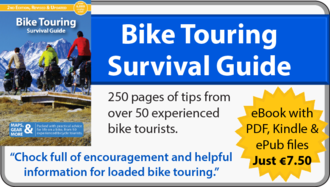 We recommend you start by downloading a free preview of our Bike Touring Survival Guide. You may also want to read some of the most popular articles on this website. Get in Touch if you still don’t see what you’re looking for. We’d love to share what we know and help plan your next cycling trip. @mk5060fcp @Inbon nee! ik reis voor mijn werk.... agendas vrijdag ochtend samen bekijken, met een lekker kopje koffie erbij? @mk5060fcp @Inbon wanneer gaan we samen eten? ik kijk er naar uit!